In a previous tutorial, we took a deep dive into the WordPress HTTP API and I promised to show you how APIs can be consumed via the HTTP API in a WordPress plugin. We’ve seen an example of a plugin using the HTTP API during the course of building a Domain WHOIS and Social Data WordPress Widget and in today’s tutorial, we will write a plugin that integrates a CAPTCHA with the WordPress login system using Google’s reCAPTCHA. And of course, the HTTP API will be used to send a POST request to reCAPTCHA to validate the user’s answer to the CAPTCHA challenge. Below is a screenshot of the default WordPress login form protected by a CAPTCHA on activation of the plugin to be developed during this tutorial. Before we begin coding the plugin, head over to reCAPTCHA, register your domain name and grab your public and private API keys. Create a PHP class with two properties that will store your reCAPTCHA’s private and public key. When writing WordPress plugins the OOP way, all action and filter hooks should be in the constructor ( __construct ). Our plugin’s magic constructor method will consist of just two actions hooks that will add the CAPTCHA to the login form and validate the CAPTCHA response. Code explanation: First, my reCAPTCHA public and private keys are saved to their class properties. The captcha_display() method that will output the reCAPTCHA challenge is added to the WordPress login by the login_form Action. The validate_captcha_field() method that will ensure – the CAPTCHA field isn’t left empty and also the answer is correct – is included to the login validation system by the wp_authenticate_user Action. Below is the code for the captcha_display() and validate_captcha_field() method we talked about. Taking a closer look at the validate_captcha_field() precisely the second if conditional statement, a call is made to recaptcha_response() to check if the CAPTCHA answer is correct ( i.e. returns false if the CAPTCHA response is wrong). Let’s see the code and explanation of recaptcha_response(). 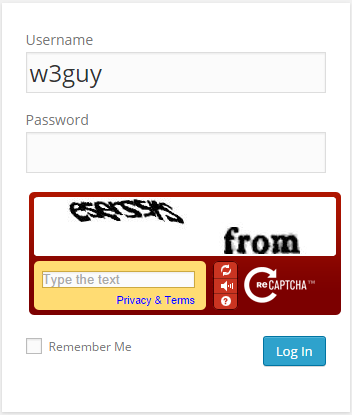 Code explanation: To verify that the CAPTCHA answer supplied by the user is correct, a POST request need to be sent to the endpoint http://www.google.com/recaptcha/api/verify with the following parameters or body. remoteip The IP address of the user who solved the CAPTCHA. challenge The value of recaptcha_challenge_field sent via the form. response The value of recaptcha_response_field sent via the form. First, the challenge and response POST data sent by the form is captured and saved to $challenge and $response respectively. The IP address of the user is captured by $_SERVER["REMOTE_ADDR"] and save to $remote_ip. The POST parameters is passed as an argument to recaptcha_post_request() which will send the request along with the parameters to https://www.google.com/recaptcha/api/verify with the API response returned. recaptcha_post_request() returns true if the CAPTCHA answer is correct and false otherwise. Code explanation: An array $args with the POST body $post_body save to the key body is created. The wp_remote_post send the POST request with the response save to $request. The response body is retrieved by the wp_remote_retrieve_body and saved to $response_body. To get the recaptcha_post_request method to return a Boolean value i.e. true on success and false on failure; the response $response_body is exploded and the array data with index 0 trimmed to remove any redundant white space from the beginning and end of the string. Finally, we close the plugin class. If you wish to use the plugin on your WordPress site or to study the code in-depth, download the plugin. This is the second in a series that will demonstrate how the WordPress HTTP API is used in a plugin.